Inside the device, there is 1.7GHz Quad Core processor which can score good points in Benchmark tests as well. To boost the speed, we've 2 GB RAM inside. 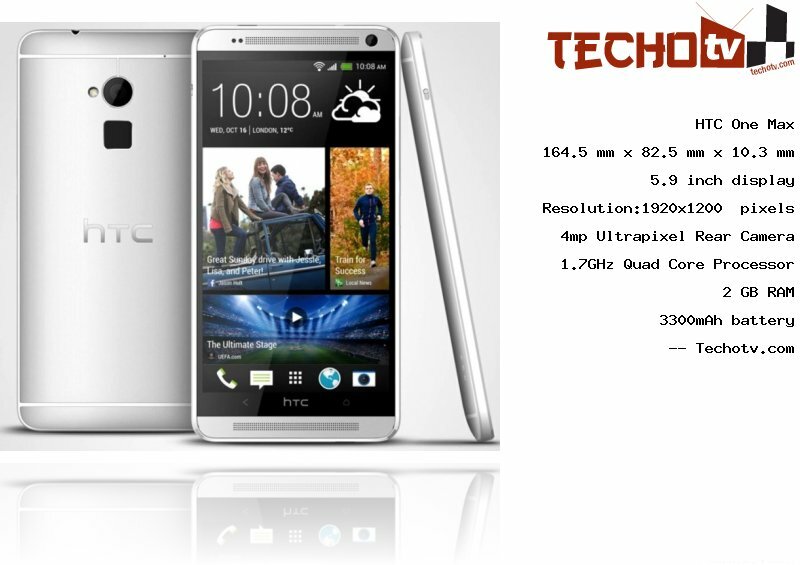 The screen resolution of HTC One Max phone is 1920*1200 pixels and the display is of 5.9 inch. We can't help but admire its display which has pixel density of 373 ppi. It measures 164.5 mm x 82.5 mm x 10.3 mm. It has internal memory capacity of 16/32 GB. The primary camera at the back of device is of 4mp Ultrapixel. There is 2.1mp (1080p video recording) camera at front for video-calling and other needs. infra-red port for remote functionality. fingerprint sensor on the back of the handset. Sensors - accelerometer, gyro, compass, fingerprint, light, proximity. HTC Sense 5.5 UI with HTC BlinkFeed, HTC Zoe.